Much of the material below had previously only been available to subscribers to the New York State Sportswriters Association newsletter. 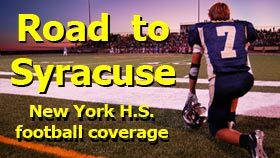 When the NYSSWA ceased publication of the weekly newsletter in the summer of 2012, we moved the record book -- including extensive lists of all-time individual passing, rushing, receiving and kicking performances -- onto the RoadToSyracuse.com. Our record book is the most comprehensive New York high school football information available anywhere. We will continue to make updates to the records categories in August of each year based on the research of Paul Hutzler and the work of reporters and coaches across New York. Much of the rest of the material is the result of tireless work by the NYSSWA's Neil Kerr and Steve Grandin and is also updated regularly.